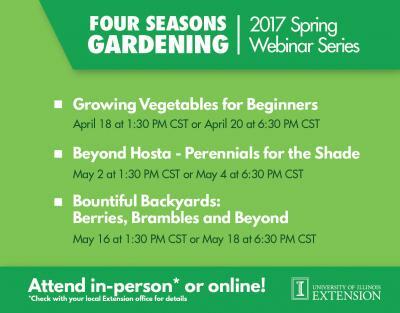 The spring series of University of Illinois Extension's Four Seasons Gardening program focuses on environmental stewardship, home gardening, and backyard food production. The first session of the series is titled, Growing Vegetables for Beginners. The program is offered twice – on April 18 at 1:30 p.m. and again on April 20 at 6:30 p.m. Produce always taste better when you are enjoying the fruits of your labor. Join Jennifer Fishburn, Horticulture Educator, as she shares tips for successfully growing vegetables in a small space. Other topics in the spring series include Beyond Hosta – Perennials for the Shade set for May 2 and 4, and Bountiful Backyards: Berries, Brambles, and Beyond set for May 16 and 18. All sessions are shown on Tuesdays at 1:30 pm and repeated on Thursdays at 6:30 p.m. They are all available for live home viewing. Contact your local Extension office to inquire about attending the webinar at an Extension office. Following the session, a taped version is available on YouTube. There is no fee to attend. However attendees must register in advance. Each live session is about an hour long and provides an opportunity to ask questions with the presenter. Registration and YouTube information are found at http://web.extension.illinois.edu/hmrs/4seasons.